Growing up in a home with eight siblings equals a home that is not always in the best condition. Have mercy on my mom! I can barely keep up my house with only two kids. So, it’s no surprise that my mom really didn’t put a lot of thought or money into decorating or maintaining our house. Because sooner or later, it will get destroyed. Now that my parents are empty-nesters (almost! ), it’s fun to see a side of my mom that I never saw while growing up. A side of her that enjoys creating a beautiful home–inside and out. Now having my own home and my own kids, I don’t really want to wait until I’m an empty-nester to enjoy a fabulous home. But I don’t really need too. There are so many great furniture lines today that can take the bashing of kids. I really like how this family updated and renovated their home by making it kid-friendly but stylish. Great house and great ideas. 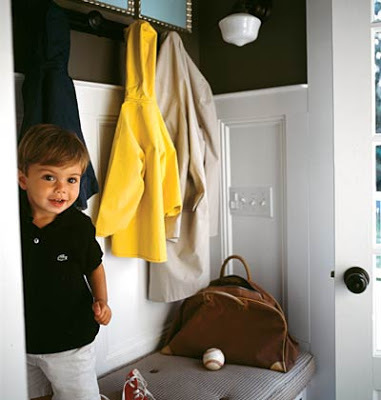 The mom used outdoor fabric for all the kitchen chairs, rugs that hide dirt, dark paint in mudroom. The post Kid-Friendly and Fabulous appeared first on Darling Darleen | A Lifestyle Design Blog .